I am a dog person. However, my husband and oldest son love cats.....so we have three of them. The cats and I get along, somewhat. I am the one that cleans their boxes and spends most of the day with them. Yesterday our oldest male cat pushed me when I was trying to figure out what a smell was around his food dish. Not just a little tap either, he was seriously trying to push me over. I think the cat is a little too smart. Whenever he is mad at me he does sneaky little things to annoy me. He knows exactly what buttons to push. Then when my husband comes home he acts all sweet and nice. It's a cat conspiracy. I prefer our dogs. If one of them annoys me, I put them outside or in their crates. Easy enough. If one of the cats gets upset my furniture or rugs suffer. So I definitely prefer my dogs, cats are a little too much like angry sneaky humans. I have one more week of my two boys being home for summer break. Trust me I am literally counting down the days until school starts next Wednesday. Since I have two growing boys home everyday I have been making a lot of bread and baked goods. We can go through whole loaf of bread in a couple of hours (no joke). 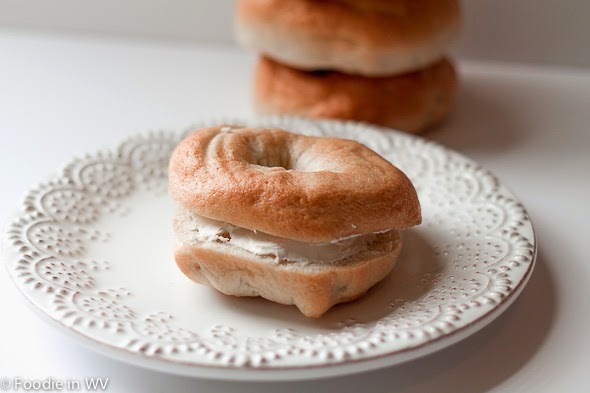 This week I tried a new recipe for Homemade Bagels from Allrecipes.com. 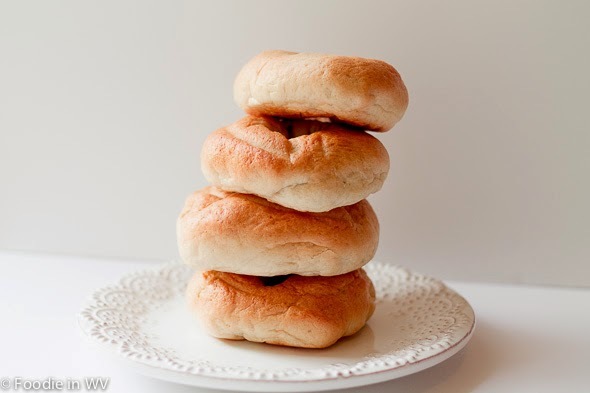 An easy bagel recipe that can be made with a bread maker, mixer, or by hand. Freeze well so they can be made in big batches. Add the first 6 ingredients to your bread maker in the order recommended by your bread machine (for mine I add wet ingredients, flour, and then yeast). If you have a bagel cycle select it, if not select the regular dough cycle (on my machine the only difference is that the bagel cycle has a longer rise cycle - 1 1/2 hours). Check the dough while the cycle is kneading, oftentimes more water or flour need to be added. The dough will come into a nice ball and stretch when it has adequate amounts of both. Alternatively if you don't have a bread maker this recipe works by hand or in a mixer. Add all ingredients to you mixer (or a bowl if making by hand) and knead 8-10 minutes. Oil a bowl (I prefer glass since it doesn't get cold like metal) and place dough into a ball. Cover with plastic wrap or a kitchen towel and let rise 2 hours (skip this step if you are using a bread maker since the bread machine does it for you). Take the bread dough out of the bread machine and punch it down. Divide into 10-12 pieces (you can make your pieces bigger or smaller depending on the size of the bagel you prefer). Place your thumb through the middle of the ball, making a hole, and pull out to make a round doughnut shape (use your other 4 fingers and other hand to help with the pulling). Alternatively you can roll each piece into a 6 inch rope and then join the ends (I prefer the first method since my ends never seem to stay together). Cover the bagels and let them rest for 15 minutes. Bring the 4 quarts of water to a boil. Drop the bagels in the water and allow to boil 30 seconds on each side. Move the bagels to the baking sheet. If you want to add toppings do so now (poppy seeds, sesame seeds etc.). You can also add an egg wash in this step: 1 tablespoon of water and one egg white. Combine and then brush on top of bagels. Then add toppings. Bake bagels for 20 -25 minutes, rotating the pan halfway through. The amount of flour and water can vary greatly depending on how liberal you are with measuring the dry ingredients and how accurate your liquid measuring cups are. I always check my dough during the kneading cycle and add more water/flour in order to achieve a dough that stretches and doesn't break with pulled gently. Play around with the toppings, I have tried everything from bacon to chopped nuts and they all are delicious. The toppings are where you can really make the bagels something special. These freeze very well. Just slice each bagel in half, place halved bagels in a freezer bag, and store for up to 3 months. They are great for weekday breakfasts since they can be placed in a toaster straight from the freezer. That's it. I love making homemade bagels. They are much cheaper than the store version and are delicious topped with cream cheese, butter, or jam. I can't believe you go back to school so early down there. We don't go back till September. Love these bagels look amazing. Have a nice weekend Ann! I love bunnies, but I think our cats would harass them too much :) Thanks for the sweet comments about the recipe! I love both dogs and cats, while my husband loves cats..He said you don't need to walk cats...but dogs...at least 3 times a day. 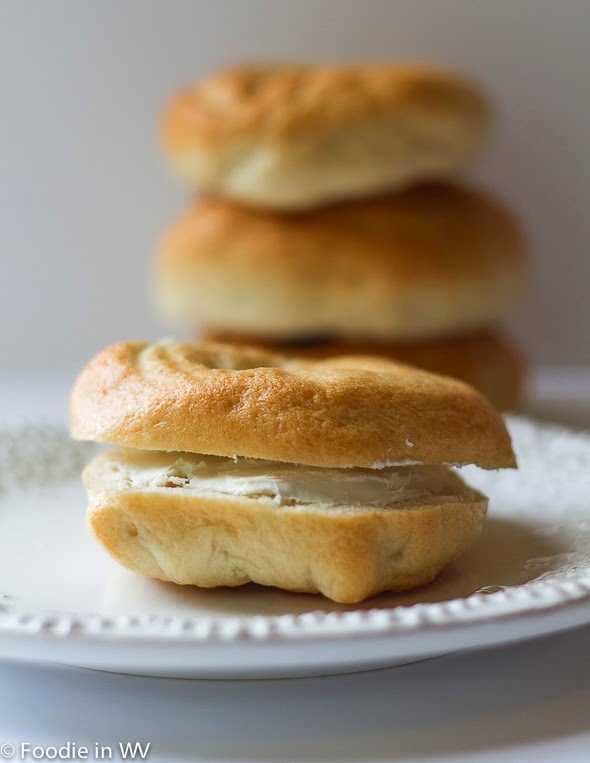 These bagels look great and would make some great sandwiches too. Yeah my boys go back to school in a week and a half as well and while I'm happy they're going back I'm also kinda going to miss them being at home underfoot. As for cats and dogs, we have them both here, 1 of each and I prefer my dog as well. My cat though is too lazy to be sneaky lol. You could add raisins to this recipe and it should work fine. Just add 1/2-1 cup during the kneading. I've never tried making bagels but I've always wanted to. Thanks for sharing. We're going back to school a week from Wednesday...we're all ready. The bread machine is great for making doughs, I love it! Pinned!! and so ready to make these! I love bagels!! I love this! I can't wait to try them! It's so great to meet a fellow WV Food Blogger! It's always nice to meet another blogger from WV! Going over to check out your site now!